Finding mining-related solutions at the world’s largest trade show can be complicated. Let us show you the way. Every three years, Messe München hosts the bauma trade fair in Munich. Billed as the world’s leading sector event for construction machinery, building material machines, mining machines and construction equipment, the exhibition space totals 640,000 m2, making it the largest trade show on earth. For 2019, Messe München expects to have 3,500 exhibitors from 60 countries. 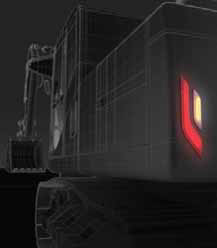 Unlike other large equipment fairs, bauma has dedicated a portion of its program to mining. Mining represents roughly 20% of the exhibition. The mining sector has its own hall: C2. According to Messe München, a total of 578 exhibitors indicated they are involved with mining, extracting and processing raw materials. Visitors reviewing exhibitor information will note the mining symbol and the phrase Mining Inside. Miners hoping to make the most of their time, however, will need to narrow the field. For them, E&MJ offers a selection of “must-see” stands. What follows is a compilation of announcements leading up to the event. ALLU’s attachment crushes as it loads. In addition to its existing state-of-the-art screener/crusher equipment being exhibited at the show, ALLU will also be introducing new products and solutions, including a new Mobile App with new functions aimed at helping improve productivity, job-site safety and customer service. The new Mobile App is the latest development for ALLU’s communication system. It provides an intelligent digital solution for customers and operators to obtain accurate and timely operational information, thereby maximizing safe and productive use of ALLU equipment. Through easier and improved contact functionality, customer support is also enhanced through the new features of the app. There will be live demonstrations throughout the show from the ALLU stand (FN.1021/2 in the open area, north). The BEUMER Group (Hall B2, Stand 413) will provide information on their efficient transport solutions for the mining industry. Overland conveyors and pipe conveyors transport various raw materials over long distances and often through rough terrain. This is generally faster, more cost-efficient and environmentally friendly than trucking. High angles of inclination and tight curve radii are not a problem. BEUMER Group relies on camera-equipped drones for the planning, projection, implementation and documentation of these systems. Using special software solutions, the system supplier evaluates the aerial photographs photogrammetrically to generate digital terrain models. The BEUMER product range also includes stackers and bridge reclaimers for storage yards, whether with or without blending bed systems. These stack bulk material and guarantee a maximum blending effect. Users can also efficiently homogenize large quantities of different bulk materials and bulk material qualities and ensure the uniformity of the raw materials used. For efficient loading, BEUMER Group supplies ship loaders with fixed booms and extendable telescopic belt conveyors. The Brokk TE160 rock drill attachment. As Brokk’s machines have become more technically advanced and market demand for mechanization has increased, demolition robots are increasingly used for a more varied range of applications requiring additional tools. Over the last few years, to meet this demand, Brokk has developed new attachments and upgraded its machines to work well with a wider range of tools. One of those is a rock drill attachment. These are customized and fully integrated with the control and operation of the Brokk robots. The range has been extended with the powerful new TE 326 drill attachment used on the new Brokk 300 and Brokk 500 models. This creates a complete range of rock drills for Brokk machines, from the small TE160 used on the compact Brokk 110 to the powerful TE360 used on the biggest Brokk machines. All drill rigs are characterized by their exceptional performance- to-weight ratio, the company said. Evonik will present two of its leading technology solutions at bauma (Hall A3, Stand 244): DYNAVIS technology, which optimizes the viscosity of hydraulic fluids; and industrial gear oil formulations based on NUFLUX technology, which perform as well as synthetic based fluids, at a lower cost, the company said. Changing from a standard hydraulic fluid to one formulated with DYNAVIS technology generates many benefits, including increases in machine productivity and improved fuel efficiency, according to Evonik. Additional benefits include the machines operating more efficiently, reacting better, needing less frequent service, and suffering less wear and tear, ultimately extending their service life, according to Evonik. And, this pays off quickly, most notably in extremely demanding applications, while also assuring higher returns, lower energy consumption and reduced CO2 emissions. Companies who focus on mining, road construction, demolition or earth-moving have realized increased profits, with peak efficiency gains reaching up to 25%, according to Evonik. A current test project on a Hitachi EX1200 hydraulic excavator at a mine in the Kuznetsk Basin, Russia, demonstrated that the use of DYNAVIS technology yielded 7.9% growth in coal extraction as measured in bank cubic meters per hour. Oils formulated with NUFLUX technology are largely equivalent to synthetic lubricants, and even surpass them in some respects. In fact, during a recent field trial with pump gear in South Africa, a higher degree of efficiency was measured with aerators that promises to pay off. This made the plant’s decision easier to fill 26 of their gears in the water treatment system with NUFLUX formulated oil, saving them approximately EUR 17,500 per month. Lighting and electronics expert HELLA (Hall A5, Stand 436) has developed the VISIOTECH projection technology and has already launched four products to help in these situations: The LED Projection Module, the warning lights SL60 LED, Module 50 LED Spot and — particularly for mining — the RokLUME S700 Red. The LED Projection Module was specially developed for original equipment and projects an exclamation mark as a warning symbol on the ground near the machinery. For the SL60 LED and Module 50 LED Spot warning lights, a special lens optic allows the light rays to converge so much that a strip-shaped warning line or warning spot is projected on to the ground. This application serves to warn other vehicles or pedestrians of an oncoming vehicle. The lines projected in front of a vehicle can, however, also be used as a means of simpler vehicle navigation. The RokLUME S700 Red LED warning light utilizes the same principle and projects a wide red marking on to the ground, thus highlighting the danger zone around the vehicle. Thanks to its powerful light output, the warning light can also be used on vehicles with high mounting positions and is particularly suitable for mining vehicles. Liebherr will unveil electrically powered hydraulic shovels at bauma. 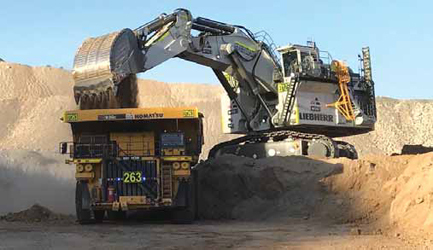 Liebherr will give bauma attendees a unique chance to experience its latest innovations first-hand, which range from construction machines, material handling, mining and components. Visitors can look forward to seeing many new technologies and other practical innovations at Liebherr’s 14,000- m2 outdoor stand (809-813) and its indoor stand (Hall A4, Stand 326). For the mining division, visitors will see demonstrations of the R 9200 E electric- drive excavator. This will be a world premiere for a machine in this class. Together with the R 9200 E, Liebherr-Mining will present the new T 236 diesel electric-drive truck. At the fair, Liebherr Components will also reveal the demo version of an app that shows the extensive functionality of all Liebherr’s condition monitoring components, from diesel engines to energy storage, hydraulics, transmissions and slewing bearings. In the future, this will enable machine manufacturers to inform fleet managers, service personnel and machine operators about the condition of their components. Mobil Elektronik wants to equip mining machines with rear-axle steering. 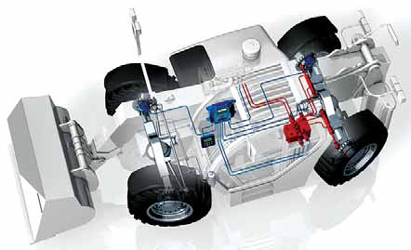 Electrohydraulic steering systems for rear axles have been standard in commercial vehicles and complex construction machinery, such as cranes, for many years. In the case of commercial vehicles, the use of electrohydraulic auxiliary steering is primarily to ensure compliance with the legal requirements. Without a steered rear axle, the legally defined minimum turning radius cannot be maintained. Most other machines, such as twoaxle loaders, usually have hydrostatic front-axle steering. It is obvious that these machines could also benefit from rear-axle steering. Mobil Elektronik (Hall A3 /Stand 115) can equip these machines with the same features that are already standard in mobile cranes. Operation will be easy and convenient. The steering mode can be changed at any wheel position. The synchronization of the axles with each other is done automatically. The Metso MX cone crusher. Along with new crushing and screening solutions, Metso (FS.1111/2) will unveil a groundbreaking innovation for off-highway trucks, enabling mines and quarries to haul more with less. This major product launch will expand Metso’s offering into completely new territory and help customers reach a higher payload while lowering their operating costs. In addition, Metso will showcase a broad range of equipment, wear and spare parts as well as services designed to help make operations more efficient and assets work harder. The solutions to be featured will include cone crushers and slurry pumps. 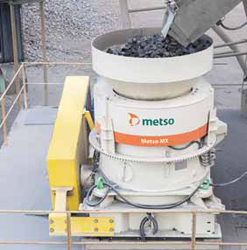 The Metso MX cone crusher with patented Multi-Action crushing technology designed to cut the operational costs of crushers and to provide more uptime compared to traditional cone crushers, the company said. Since its introduction in 2017, Metso has sold 50 MX crushers worldwide. The Metso slurry pump range is optimized for maximum uptime and reduced operating costs. The slurry pump maintenance slide base offers fast, safe and easy wear component change or pump inspection. Leaving the suction and discharge pipe undisturbed during inspection, the entire rotating assembly and motor configuration is slid back. Normet’s line of auxiliary equipment for underground mining applications is well known. The company’s Rock Reinforcement business line has developed new innovative products that can help solve some of the toughest challenges. The D-Bolt, for example, is widely used as part of the ground support system in some of the largest and deepest mines. The company’s locally anchored, self-drilling hollow Rock Bolts can be used in combination with its construction and mining chemicals, where conventional systems are not delivering the desired results. In addition, Normet is devoting time and resources to further develop the next generation of rock reinforcement systems, creating even safer underground environments. The D-Bolt represents the new generation of energy-absorbing rock bolting systems, specifically designed for efficient and reliable rock reinforcement, in both squeezing and burst-prone strata conditions. The technology is based on a smooth steel bar with a number of anchors along its length. The newest addition to the D-Bolt family is the Connectable D-Bolt, a system that is extendable through specially designed couplings. This bolt type is especially effective for smaller profile spaces where there is a need for a longer bolt anchoring offering an alternative to cable bolts. For areas where ground conditions are very difficult and demanding, Normet designed an innovative, patented bolt combining the features of the Self Drilling Anchor (SDA) and D-Bolt. Normet produces two types of anchor taking into consideration design and load bearing capacity. For the North American mining market, Normet designed the bolt to reflect Nevada mine conditions, the SDDB — Nevada type. The anchor is a 2,400-mm long Self Drilling Hollow Bar made from a single piece seamless tube with a 32-mm diameter. The thread is ISO R32 rolled with uneven length from each side. The material for the SDDB Nevada type has been carefully selected to respond to a customer’s inquiry for yield load and elongation at break. The bolt is typically used for single length applications although it can be extended with couplings to reach the desired length where necessary. This anchor utilizes a drill bit and longer root threaded section for anchorage. Scania will display five trucks at bauma. Superior Industries (Hall B2, Stand 107), an American builder of crushing, screening, washing and conveying equipment, said its presence at bauma 2019 will be three times larger than previous editions. 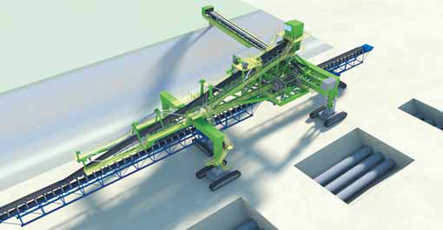 In addition to wet processing equipment, Superior will display conveyor components, including the Chevron Pulley, a V-shaped wing pulley that deflects oncoming rocks; the Moxie Roll, an idler made from a composite blend, which are 50% lighter and at least three times quieter than steel; the High Performance DT Idler for improved performance in high capacity applications; and the Exterra SFL Dual Belt Cleaner, a primary and secondary scraper sharing one mounting pole. the leach pad and tailings. thyssenkrupp Industrial Solutions will present its new mobile stacking bridge, “the lizard.” This unique solution for heap leaching and dry tailings stacking combines two proven technologies — the conveyor bridge and the tripper car — in a new way. The lizard decouples the crawler-mounted tripper car from the conveyor bridge, enabling it to be controlled independently of the bridge. Decoupling the tripper car from the conveyor bridge has several advantages: The transitions between the bridge segments are easier as there is no stress from a traveling tripper car on top of the bridge. As the loads on the bridge sink, the overall construction of the bridge outweighs the additional chassis and structure of the tripper car. This way the product saves weight and costs, according to the company. In addition, a larger dump height and longer outreach are possible. “Especially with longer conveyor bridge systems the lizard pays off with lower investment cost and less fatigue issues on the bridge structures,” said Stefan Ebert, global product lifecycle manager. “Since the tripper car is not traveling on the bridge, the loads for dimensioning the bridge are significantly reduced,” said Burhan Osmani, engineer at thyssenkrupp Industrial Solutions and the inventor of the lizard. Operators benefit from a slimmer, lighter bridge structure, lower bridge height, smaller bridge crawlers and lower ground pressure. The same lightweight design can also be used for the reclaiming bridge. Fatigue issues otherwise caused by cyclic loads from the tripper car are completely eliminated, the company said. This significantly reduces maintenance requirements and increases availability. A key advantage of the lizard is its multi-crawler chassis. thyssenkrupp used its expertise in this area to develop a unique solution that improves productivity. A multi-crawler chassis with no override control, the so-called “float system,” is attached to the tripper car. The double crawlers with no steering cylinders ensure unrestricted maneuverability in all directions. The system can be attached to any crawler to avoid the large turning circles of conventional gearing systems. “To be able to flexibly control the mechanically independent multiple crawlers is a game changer in mobile mining equipment,” said Paulo Costa, head of mining systems. The float gearing system allows the lizard to be operated flexibly: When a stacking row is completed, the tripper car is at either the front or rear end of the bridge. Before moving to the next stacking row, the tripper car has to turn its crawlers through 90° in the direction of bridge movement without impacting the performance of the system. In this way, the tripper car and the stacking bridge move backward or forward as one stacking system depending on the stacking plan. No two mining projects are the same, which also applies to the dewatering systems. Two new pumps by pump manufacturer Tsurumi offer greater scope to come up with ideal solutions. With its innovations KTZ415 and KTZ615, the Japanese company has outdone its series of professional drainage pumps for difficult applications. The 615 is the new top model of the KTZ series that now comprises 15 models. Thanks to a motor output of 15 kW, the aggregate achieves up to 2,800 liters per minute (l/min) with discharge heads of almost 40 meters (m). In contrast, the 415 with the same motor only pumps 2,000 l/ min, but up to a maximum height of 55 m. Both submersible pumps can cope with heavy particulates with grain diameters of up to 12 mm. The pumps are pressure-resistant to a submersion depth of 25 m and have a pressure port with a diameter of four (model 415) and/or six (mode 65) inches on the outside thread. Tsurumi will be displaying many other pump models (Hall A6, Stand 338), as well as another innovative that it still under wraps but which will be launched in 2019. Engineering enthusiasts can also look forward to exhibits of cutaway pump models and live wet applications. Wirtgen’s 220 SM 3.8/220 SMi 3.8 surface miner selectively mines raw materials up to a cutting depth of 350 mm and a uniaxial compressive strength of 35 megaPascals (MPa). Thanks to its 3.8-m-wide cutting drum designed specifically for soft-rock mining, the compact surface miner achieves maximum productivity at low operating costs and is perfect for use in small to large mining operations, according to Wirtgen. The 220 SM/SMi’s cutting drum has been designed specifically for demanding windrow applications in soft rock, such as coal or salt. 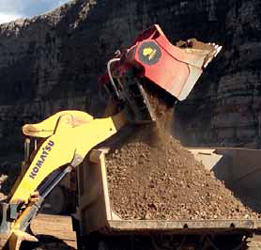 Maximum cutting performance combined with the ideal use of engine power and low specific fuel consumption allows raw materials to be mined in an extremely cost-effective process. Six different adjustable cutting-drum speeds ensure that the machine can be perfectly adapted to the material being extracted. This leads to a significant reduction in pick wear, minimal diesel consumption, and increased productivity, which translate into an impressive daily output and low cost per ton of extracted material. Wirtgen’s 220 SM 3.8/220 SMi 3.8 surface miner selectively mines soft rock. In surface mining, the continuous availability of the machine and its safe operation are of critical importance. This is why the surface miner’s components are designed to achieve a long service life, even under extreme conditions. For example, filters in all circuits and a pressurized hydraulic reservoir ensure maximum purity in the hydraulic system and, as a result, safe operations. The clean oil in turn prolongs the service life of the downstream components and thus increases the availability of the machine. The 220 SM/SMi also meets occupational safety requirements in surface mining thanks to the standard-equipped ROPS/ FOPS operator’s cabin. The cabin features additional soundproofing and vibration isolation, allowing the operator to work for several hours without the risk of fatigue. The ergonomically designed and clearly arranged controls are integrated into the armrests of the driver’s seat, and all of the machine’s key functions are logically incorporated into the multifunctional joysticks. This means that the operator can operate the machine intuitively in just a few steps and fully concentrate on high-precision mining. The state-of-the-art, fully air-conditioned, large-capacity cabin also features generously sized windows, giving the operator a direct view of the cutting edge and with it, the results of their work.